Despite ordering the Yubos for both kids on the same day, Faith's arrived the day after Ben's, much to her chagrin, and I had already had lunches made by the time it showed up at our door last Thursday, so it had to wait till this week. As soon as she saw the container, she said "You know what would be perfect in here? A big salad!" Hard to argue with a kid who wants a big salad for lunch. 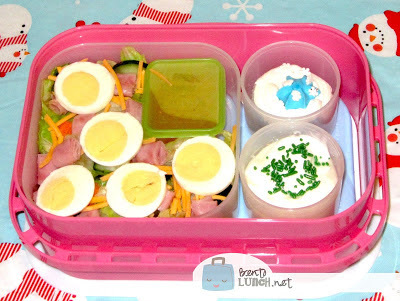 Faith had her salad--lettuce, cucumber, carrots, shredded cheese, some ham rolls, and boiled egg slices in the main container of the Yubo. I used an EasyLunchboxes Mini Dipper to hold some French dressing for her, which fit perfectly in the container. In the smaller containers, she had a mini cupcake and vanilla yogurt with a few sprinkles, then took a Cutie orange for a snack. She is loving the container, so now we just need to get some of the interchangeable plates for the front and back. I had gotten great deals on the Firetruck and Fairy Yubos, but the kids like a few of the other patterns to, so that's next on my purchase list. Yummy! I want a Yubo but I think the boy may think they are too little kiddy.